It was the best of (theatre) times, it was the worst of (theatre) times. Just over a week ago, we had our tech rehearsal for The Car Plays, which is running now at Segerstrom Center in Orange County. (It’s sold out. Don’t even try.) I directed a play called “The Night Gwen Stacy Died”; here are a few words about my cast. We rehearsed over the holidays; for this 10-minute play, one of the actors would spend five hours on LA’s notoriously convenient buses (two-and-a-half getting to rehearsal; two-and-a-half getting back home), and another one of the actors would drive about an hour each way; the third actor changed her work schedule whenever needed; one of the guys rehearsed a few days after painful, extensive abdominal surgery (! ); and our artistic producer drove two hours out of his way to check on our show when we decided we needed to rehearse all the way across town and down south in order to accommodate the guy who had surgery. Meanwhile, three people coordinated and scoured the area for the necessary costume bits and props. Oh, and the tech? The tech involved about four dozen people and 15 plays, and top-to-bottom was probably the most well-produced, well-run, efficient tech rehearsal I’ve ever seen in the 40 years I’ve been doing theatre. Meanwhile, in the past two weeks I saw an improv show billed as featuring “the top improv teams in LA” where people had no idea how to do improv — low energy; no projection; no familiarity with the announced-in-advance script prompts, and I assure you, these were very well-known script prompts; and where the second team, given its prompt (“It’s a play”) rejected it (“Actually, we’re doing a documentary”), which is a complete no-no in improv. Rarely have 40 minutes seemed so long. Dying painfully of a gut shot would’ve seemed quicker. During the third of these internal skits, I leaned in to my wife and whispered harshly, “We’re leaving” and grabbed her and ran for the exit, past the audience, who consisted almost entirely of the other people waiting to do “improv” and a scattering of friends-of-the-performers who kept shilling for the performers in a recognizably false way. The photo above is from a show I saw this weekend. You’re seeing the stage action from my seat. 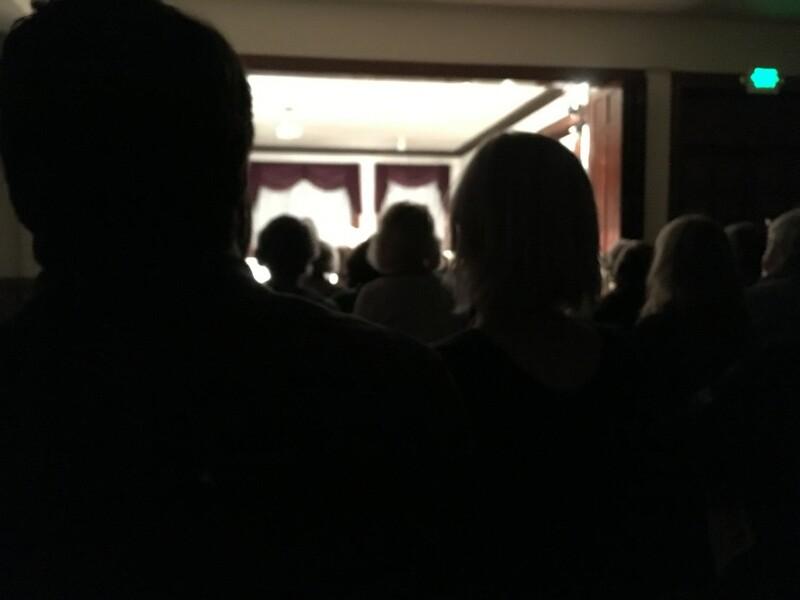 Some members of the audience dragged their chairs left and right in an effort to see something; I just gave up and decided I was attending a radio play. Before the play, the playwright introduced me to “the greatest director in the world”; judging just from that photo, I’m still waiting to meet him. I couldn’t quite figure out why this playing space had the absolute worst sightlines I’ve ever seen, until I turned around and saw that 20 feet behind us was an elevated stage! For some reason, the greatest director in the world decided to stage the play in a slightly elevated room across from the stage. This meant that, as you can see, we couldn’t see; it also meant that the actors’ words were lost to the depth of the room, and, given that there’s no light plot above a room (as opposed to, say, a stage), the actors were frequently in dim. It’s a real shame, too, because the play is better than that. But, the director and his cast found ways to bury the laugh lines too. My best advice: Surround yourself with people who know what they’re doing. Whether it’s doing live performance or changing the oil in your car. By the way, the young woman in front of me, in the center above, had beautiful ash-blonde hair, as well as an attractively smooth back, both of which I got to admire closely for an hour and a half. 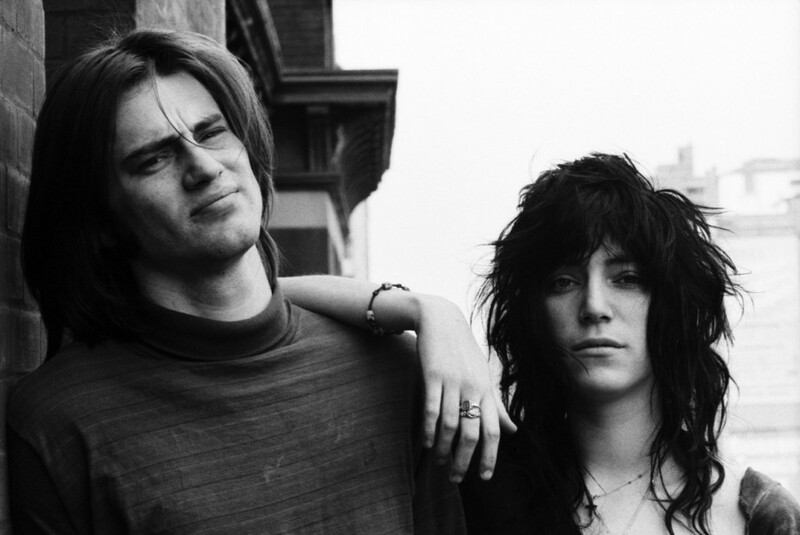 Patti Smith’s terse but beautiful remembrance of her close friend Sam Shepard. On this blog, I write about Donald Trump as little as I can bear; he already hogs too much of my day everywhere else, so I don’t want it here as well. Anyway, here’s the piece. It’s an all-too-true characterization of the current president of the United States. Here’s the transcript of the Associated Press interview with Donald Trump. I don’t expect you to read it all. I certainly don’t expect him to. I will say that this would serve as the script for my next play, but lately I’m not writing Theatre of the Absurd.